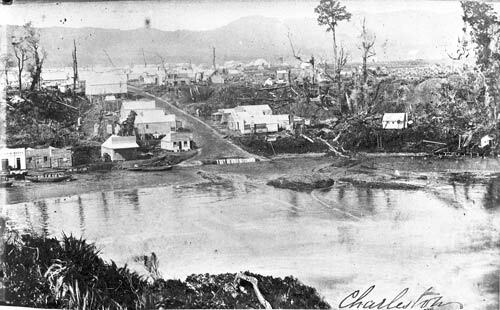 In the 1870s and 1880s Charleston was a thriving gold-mining settlement. Access was difficult, and most people and goods arrived at the tiny port in Constant Bay. As in most mining towns, there were many hotels. The Ulster Hotel,on the waterfront (far left) was the first hotel that travellers would see after crossing the Tasman Sea from Australia or further afield.